Aaron Fotheringham has earned his “whining rights,” but he’s never touched them. 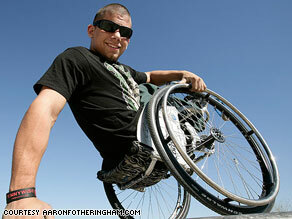 He was born with spina bifida, unable to use his legs and adopted into a home with 5 other kids. None of that has ever kept him or his need for speed down. It’s 100 degrees in Arizona, but that doesn’t keep Sadiya Buta off the court. She is part of one of the top doubles teams in her high school’s division. Like her teammates, she is clad in her school’s team shirt and skirt, but Sadiya also wears an extra layer of pants, a long sleeve shirt and a hijab, as part of her traditional Muslim beliefs. The 15-year-old is looked at like a phenom in the sport, only picking up a racket for the first time last year. Her family recently came to Tucson, Arizona from a refugee camp in Kenya. Before leaving the camp in Dadaab, Kenya, Sadiya’s family was forced out of war-torn Somalia. 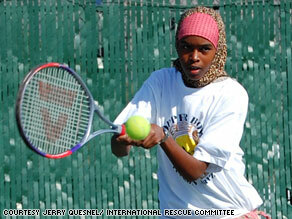 The International Rescue Committee resettled Sadiya, her 5 siblings and her parents in the United States. The adjustment for “Sandy,” as her friends call her, was a challenge, to put it mildly. She acts as a translator for her family, as they all learn English and her parents look for work. Despite the obstacles, Sadiya does whatever it takes to tackle her home life with school work and tennis, including waking up at 3 a.m. to complete her homework to keep up her better-than-perfect GPA. She admits that people at school made fun of her at first, but she paid no attention, determined to keep her eye on the ball. We all use Styrofoam and don’t realize it. Beyond packaging, it’s in the tables we use and the airplanes in which we fly. We’ve long heard, though, that it’s not the most environmentally friendly product, taking 10,000 years to break down. 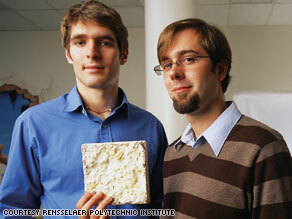 Enter two 24-year-old innovators with some mushroom roots and seed husks. Eben Bayer and Gavin McIntyre are the co-founders of Ecovative Design, a company that builds a completely organic and natural Styrofoam replacement. In non-scientific terms, they grind up seed husks and glue the small pieces together with the mushroom root, yielding a product that’s natural and completely compostable. Unlike other sustainable inventions, like ethanol, their product doesn’t come from anything humans or animals can consume, so their materials are available in abundance. The two now run a 10-employee operation that is fueled primarily by grants and scientific competitions that have brought the young men upwards of $1 million. “If you have a passion and a vision and something that you know is attainable, drop everything and go for it. Don’t keep your side job because your concentration and focus will be deterred. Follow your passion,” Gavin says. If Vanessa Nunez needed school supplies, she needed to buy them herself. Same went for food and clothes. She started working, busing tables at a local restaurant, to help her single mom pay the bills. Throughout high school, she went to school during the day and worked until 1 or 2 in the morning. With all her focus on making money to survive, her school work suffered. She had little educational direction until she joined Genesys Works, an organization dedicated to teaching underperforming high school students computer skills and placing them in corporate internships. “Had I not joined Genesys, my life could have been typical: minimum wage, maybe two jobs, no benefits, no vacation, no holidays off, and a lifetime of living paycheck-to-paycheck,” Vanessa, now 19 and a student at University of Houston Downtown majoring in Management Information Systems, says. Like a lot of little boys, Kyle Taylor loved to swim. He was an avid swimmer until he blew out his shoulders during his first year of college. 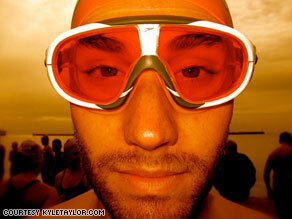 Once he started grad school in London, Kyle wanted to take up swimming again, slowly. But the “take it easy” approach lasted only until he met a boy named Harvey Perry. Harvey was also trying to use athletics to overcome adversity, having had lost both of his legs to meningitis, he wanted to get running prosthetic legs. Even though Kyle was in pain, he pushed himself to swim the English Channel to raise money for Harvey. He trained day and night, finally swimming the the length of the coast (due to weather concerns) and raising $10,000 for Harvey to get his legs. Chelsey was 6 years old when her mom died of leukemia. She was 13 when her father was murdered. Desperate, but hard-pressed to find the resources or a way to cope with the death of two parents, she decided to tell her story. 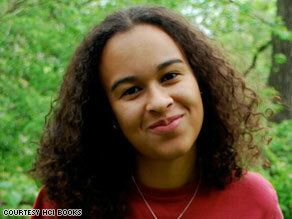 She is an author for the “Louder than Words” memoir series, written by teens and meant for teens. “Writing gives me a really important outlet for my emotions. Especially right after my dad’s death. All I did was write. It helped me put out my feelings of extreme sadness and hopelessness and put it into something constructive,” Chelsey, now 17, says. They say the pen is mightier than the sword, but maybe the pen also helps you deal with the sword’s might. Chelsey hopes it does for her, and that she can help other young people in the process. When Felice Gorordo imagines a “perfect Cuba,” he sees young people able to gather in front of their school and discuss issues openly and freely at workshops, parties, discussions, or performances. Felice would love to see a society where young people can reflect on their hopes and fears and ultimately help each other, looking toward the future. 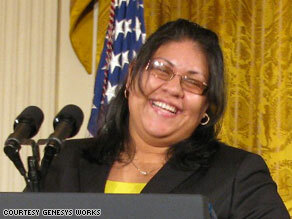 Felice, 26, is one of the founders of Raices de Esperanza or Roots of Hope. 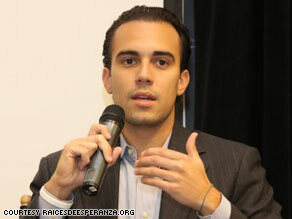 It’s a non-partisan organization that encourages dialogue between young Americans and Cubans. If it were up to Felice, students wouldn’t get kicked out of school because they didn’t sign referendums they don’t agree with, a story he’s heard happen in Cuba time and again. Felice’s group is working different projects that he hopes will help do just that. A notable one is “Cell Phones 4 Cuba.” Raices de Esperanza basically collect cell phones for people on the island because they normally cost $50-$150 and the average monthly salary is $12-$15. Getting access to that financially out-of-reach gadget, Felice believes, will be a big step toward more invaluable communication.